LeChuck advanced on Guybrush Threepwood as he stood between the possessed pirate and his lady love, Elaine. "But, it's not even bedtime! And besides, I'm not done with you yet," Guybrush quipped as he swung at the pirate again with his cutlass. "By the way," Guybrush paused in mid-sword fight, "did you know they're coming out with a new Monkey Island series?" "Surely this isn't the time for this?" Elaine pointed out. "No, really, it's being made by those guys that did Sam and Max, and the one about the guy and his dog." "You mean Charlie Brown and Snoopy?" LeChuck interjected in mid-swing. "No, no. The other guy and his dog. You know." "Oh, you mean Wallace and Gromit!" Elaine exclaimed. "I love them!" "Enough of this! Let's have at it, boy!" and LeChuck took another swing at Guybrush, which he artfully dodged. "Look, how can I tell you about this new episodic adventure starring me, Elaine, and a whole cast of new piratey characters if you keep swinging that thing at me?" "I dunno, but let us know when ya figure it out," LeChuch sneered. "It's got lots of adventure, and puzzles, and... ummm... action figures!" LeChuck stopped in mid-swing again. "Action figures, ya say?" "I think you've got him, love!" Elaine whispered, "Now, finish him off and get us out of here." "Not until I finish talking about chapter one of this great new adventure, Launch of the Screaming Narwhal!" Guybrush said. "Oh, Guybrush," Elaine sighed. She would have put her head in her hands, but they were tied behind her, and she had already come to the conclusion that her head didn't tilt that way. For those who were looking for the remake of The Secret of Monkey Island, that one is set for release later this month. Tales of Monkey Island is a completely new series, an adventure that takes place "sometime after an imaginary Monkey Island 5" according to design director Dave Grossman. And from scene one, it looks, acts, and feels like it. We are greeted by familiar voices right off the bat, as both Dominic Armato and Alexandra Boyd have returned to provide the dialog for Guybrush and his lady love, Elaine. Unfortunately, Earl Boen was unable to return to voice LeChuck, but you will be able to hear him in the Secret of Monkey Island remake. Analysis: The style of Tales of Monkey Island is in keeping with the style of the original series. In fact, the character designs and backgrounds are very similar to the series' first 3D outing, Escape from Monkey Island. Here the game is rendered in real-time, unlike Escape which mostly used pre-rendered backgrounds. Other advanced graphics effects are in use here, as well, such as lighting and focus pulling. The engine also supports high resolutions, although it ran somewhat choppy on my system at my maximum screen resolution of 1440x900. Lower resolutions render the game just fine, and it looks gorgeous anyway. Of course, the sound here is top-notch. The voice acting, as always with the series, is extremely well done. Unlike other recent entries into the point-and-click adventure genre such as Jack Keane, the voice acting doesn't sound like it's being provide by the rejects of the local community theatre troop. Micheal Land returns to provide the background music for the new series and does a fantastic job. The soundtrack adds to the scenes in front of you without taking over, and is great to listen to in its own right. The hallmark of the Monkey Island series has always been the writing, and series writers Mark Darin, Michael Stemmle, and Sean Vanaman do not disappoint. The snappy banter is there, as are the silly one-liners that Guybrush seems to always come up with. There are some great moments, such as when Guybrush is trying to guess what the password is to get in to see Deep Gut. "What's the word?" "I understand that the bird is, in fact, the word." Other encounters with characters are also well done. As you go through the dialog, you are presented with choices as to what to say next. One thing that I noticed is that you often do not say the text that you choose. I am assuming that perhaps we are given an insight into Guybrush's internal dialog as he talks with the characters, but it is odd, never-the-less. 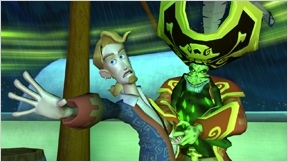 The one complaint that I have about the game comes in when you have to control your main man, Guybrush Threepwood. Unlike previous games in the series (and pretty much every other point-and-click adventure game) Telltale Games has chosen to drop the usual "click to go here" control scheme. Instead, you have the choice of using the [WASD] keys or clicking and holding the left mouse button and rotating Guybrush in the direction you want him to walk. The click and rotate scheme gets annoying about 25 and half seconds into the game, as you bumble around the deck of your ship trying to find some root beer. Why they didn't stick with the standard interface is beyond me, but if you use the keyboard, you'll be a much happier pirate. While Launch of the Screaming Narwwhal may not have the replayability of other entries in the Monkey Island series, it is an excellent lead-in to the set of episodes, and it includes enough witty dialog and head-scratching puzzles to keep you busy until The Siege of Spinner Cay makes it's appearance next month. With plenty of comedic value, and a surprising cliff-hanger of an ending, you'll definitely want to set sail with Tales of Monkey Island. "You fight like a dairy farmer..."
Tales of Monkey Island: Launch <br />of the Screaming Narwhal Walkthrough now available! After watching the initial cut scene, walk to the left and click the voodoo recipe on the mast. It reveals you need enchanted fizzy root beer to spray on the cutlass. Walk up to the wheel and pick up the monkey coffin to the right. Examine the monkey coffin in your inventory to obtain root beer. Examine root beer to discover it is flat. Combine the root beer and mints (already in your inventory) to obtain fizzy root beer. Use the fizzy root beer with cutlass to satisfy the recipe. After cutscene, move to the left and talk to Elaine. Ask her to throw the rope - she'll knock over the pole so you can cross over to her ship. Examine Chuck the Plant and notice the overgrown roots. Use cutlass on the plant to get root. Use the root and the mint with the barrel of grog. Then use the cutlass on your replacement fizzy root beer. Use the enchanted sword with LeChuck to trigger cutscene and start Chapter 1. Knock on door to Club 41 - you need a membership card. Go left and talk to Nipperkin again. Continue left past courthouse. On the screen to the left of the courthouse, pick up the Pirate Hunter sign on the post. Continue on path to the dock and meet the Captain of the Screaming Narwhal. Talk about the ship, and his Club 41 membership. Click on the socks on the clothesline to obtain the Club 41 membership card. On your way back to the main part of town, go up the hill to the big house. Click on the flowerpot to pick it up, and examine in your inventory to get the Nose-Shaped Flower Pot. Go back down the hill to the main road and stop at the glassblower's house to the right. Talk to Grimpdigit outside until he gives you the glass U Tube. Return to Club 41 with your membership card. You will start a brawl inside, creating a story for Nipperkin. Notice the broken martini glass to the left of the Club. Pick it up to obtain the grogatini sword. Take the path between the courthouse and the glassblower to reach the jungle entrance. Take the left path and talk to the guy with the dolls until he gives you the map. Continue talking to him until you have the conversation option "Look it's Dark Ninja Dave!" When his back is turned, grab one of his dolls. Use the martini sword with the doll to get the Action Figure with sword. Continue left until you find the pile of bombs. Pick one up. Return to town and go to the black ink vat to the left of Club 41. Use the Action Figure with Sword in the ink. Examine the map in your inventory. You need to start the treasure path at the wishing well. You can find it by returning to the jungle entrance and going left and up. Use the map with the well, as according to the map instructions. Now follow the map by listening for the correct animal sound as indicated on the map. This seems to be different in every game. Approach one of the forks of the path slowly until the animal sound can be heard, then take that path. The correct path can be back the way you came. Guybrush will say something encouraging if you are on the right path, along with a little happy sound effect. He will be frustrated if you take the wrong path. When you arrive at the hole at the end of the map, use the Ninja on the hole. Now return to the doll guy and tell him the map is real. After the cutscene, the reporter tells you he will soon reveal the Deep Gut information. Return to the dock. Go to the Screaming Narwhal. Try to climb the plank - it is too slippery from bacon grease. Now try climbing the anchor chain. This will cause a fire on the dock. Use your bomb on the fire to acquire the lit bomb. Use the lit bomb on the frilly pink underwear on the clothesline. Click on the clothesline itself - Guybrush will try to climb it, causing the captain to turn the crank to push Guybrush the other way, and will bring the lit bomb to the ship. Be sure to click the clothesline and NOT the crank. Clicking the crank will just cause the captain to send the bomb back your way. The lit bomb will blow the captain off the ship, triggering a cutscene. The reporter will now tell you the password to Deep Gut. Return to the jungle entrance. Go left, up, up, up to find the creepy shack. Knock on the door and select the correct word when prompted. Inside you'll find your old friend the voodoo lady! Explore all the conversation options. Talk to the skeleton parrot, and then grab it from the floor when it falls. On the next screen to the left of the voodoo lady, take the interesting bottle from the foreground. Walk out of the house: examine and acquire the weather vane on the ground. Leave the jungle and talk to the glassblower about the unbreakable bottle. He has a breaker, but really doesn't want to give it to you. Return to the Doctor's house. After the cutscene you will find yourself locked into a medical chair. You can move to the left, right, up and down using the arrow keys or A, D, W, S.
Turn your body so it is facing the right, toward the key on the table. Recline in the chair so your feet face the key. Click the key to kick it off the table. Turn to face the monkey and, still reclining, kick the key to the monkey. The clever guy wil let himself out of his cage. Still reclining, turn to face the wall with the projection screen with the pirate image. While still in horizontal position, kick the bell. The monkey will change the picture to an image of the strange machine in the corner. The right pedal on the floor in your current position gives the monkey a banana. Return to vertical position and hit the right pedal. This will cause the monkey to consult the picture on the wall, an image of the machine, and will go over to the weird machine. Now hit the left pedal - it will shock the monkey, causing him to knock over an x-ray of the bones of your hand. Turn Guybrush left so he is facing your computer screen. In vertical position he can pick up the x-ray with his feet. Turn toward the projector wall again, and recline into horizontal position. Kick the x-ray into the box of pictures. Ring the bell with your foot again - the monkey will come over and change the projected image to the x-ray of your hand. With the image of your skeletal hand on the wall, return to vertical position and give the monkey another banana using the right pedal. He will scamper over to the skeleton near the door. While the monkey is over by the skeleton, hit the left shock pedal. The key in the skeleton's hand will attach to the magnetized monkey tail. Return to horizontal position and hit the bell with your foot. The monkey will come over to the projector and change the picture to the pirate. Now get vertical and hit the banana pedal to make the monkey come to you. You can take the key and escape. Return to the Screaming Narwhal and board using the anchor chain. Talk to the captain, and go down to the deck and grab the cheese wheel on the left. Use the cannon - it will break the glassblower's unicorns. Return to the glassblower's house - he is nowhere in sight. Take the Unbreakable Glass Breaker from the crate outside the house. In your inventory, use the unbreakable bottle with the unbreakable glass breaker to receive an Ancient Scroll. However, it is blank. Walk back to the courthouse to your right. There is now a man outside. Talk to Hemlock about his indecipherable scroll until you get the Eye of the Manatee from him. Use the Eye on the Ancient Scroll. Return to the jungle and go to the Altar just to the right/up of the entrance. Place the map on the altar. Some of the clues on the map are animal noises like the previous map. The new icon is for Weather Vane - when it shows the vane, examine it in your inventory and follow the indicated direction. One other instruction in the middle of the list directs you to put the flowers from the Nose Pot into the well. Then follow the weather vane, as indicated on the map. Later, the calendar instruction means to walk around the calendar you will encounter once counterclockwise. After following all the instructions, you will arrive at an Ancient Portal. After the cutscene, use the Unbreakable Glass Breaker on the blue Crystal Nose in the door. Pick up the weird door face that falls to the ground. Put the parrot from the Voodoo Lady's house through the small hole in the door. Return to town and talk to the Marquis. Tell him you have proof that he's up to something. This will trigger a cutscene, give you access to the huge wind device, and Guybrush will pick up the Ancient Tool. Examine the giant wind device. Use the Ancient Tool with clamshell next to the device to trigger a cutscene where four idols rise from the ground. Walk to the idol near the wind device and examine it. Notice the interesting socket on top. Insert the weather vane into the idol and notice the face symbols on both objects. Change the face symbols on the idol to match the vane. Now use the Ancient Tool on the clamshell right next to the idol to trigger a cutscene where a giant finger will move on the wind device, and the Marquis comes and blows you out of the area. Go back into town and head to the jailhouse. Notice the carvings on the outside. Use the cheese wheel from the ship on the carvings to acquire a wheel similar to those on the idols. Go to the world map and click on the idol on the north of the island. It is missing a wheel. Luckily you can use your now engraved cheese wheel to replace it - then use the weather vane again and change the face. Use the Ancient Tool in the clamshell as before. Again, a finger will move and the Marquis will come try to thwart you. Go to the enigmatic idol to the south of the island. This one is missing a nose - replace it with the Nose-Shaped Flower Pot, and then follow the same process as the previous idols. Finally go to the messed up idol on the eastern island. You must do this one last. When you arrive the Marquis will already be there. Select the "Look its King Louis!" conversation option, and use the U Tube with his rifle. The last idol is missing the axle so you'll have to figure out the face on your own. The easiest way is to just turn the wheels and listen to the Marquis' response. If it is incorrect, he will squawk in discomfort or pain. It is the right face part, he will sigh with relief. Do this until the face is complete, then use the Ancient Tool on the clamshell. This will trigger a long cutscene of the Launch of the Screaming Narwhal! On the boat, your hand won't allow you to give directions for where to sail. Try taking the wheel - this will roll the tar in front of the cannon. Now shoot the cannon - this spills the tar. Finally, try to use the map. Guybrush falls over and gets his possessed hand stuck in the tar. You can now click Winslow to tell him where to go! After a cutscene, this chapter of the game will end. Congratulations! If anything can pull us out of a global economic recession, it's a new addition to the tres fantastique Monkey Island series!!!! The reason for the control change is because they changed from SCUMM to GRIME. Unfortunately, GRIME is a giant pile of poo compared to the glory of SCUMM (hence the graphics downgrade too). Surely you noticed that when you picked up Escape from Monkey Island? But yeah, will play this over the summer. Loved the Monkey Island series all the way through, really good humour. The new control scheme takes some getting used to, but I actually prefer the mouse controls - for me, the cardinal-direction keyboard control gets confusing if the camera angle changes, as you keep moving the same way (but if you let go of the key you have to press a different one to carry on the same way). Also felt very natural with my trackball-like mouse on the desktop here. Really looking forward to the next episode's release. Oh, great. They are STILL milking this series. Don't get me wrong, but if Ron Gilbert isn't behind the wheel, it's not Monkey Island. Not THE Monkey Island, at least. 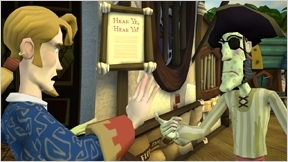 I applaud the effort, I will probably buy the game because I like supporting both Telltale games as well as this genre in general, but I can't help feeling that we are cheated from ever finding out the *real* secret of Monkey Island because the original creator never got a chance to finish his story. Pretty good game, I enjoyed it heartily. I actually liked the new rotating system more than the previous clicking one. There was only one puzzle that bugged me, and the only reason I got the answer was because of a "Okay how about THIS?" moment, when I was just wildly flinging things at it. The dialogue was funny though, and the puzzles were mostly good. All in all, TTG seem to be ressurecting the adventure game genre, one episodic game at a time. Hooray! I love Monkey Island! I don't understand why any of you here make such statements when you haven't even looked into the game. First, Ron Gilbert did have a hand in part of the Tales of Monkey Island so don't say he had nothing to do with it. GrimE engine is NOT used with Telltale, another false statement, only TWO games ever are used with that engine, those two being Escape from Monkey Island and Grim Fandango. As for "MILKING", umm when was this EVER done??? Its been YEARS upon years since anything MI has come out, get your facts straight. I always disliked the style of Escape from Monkey Island and missed the cartoony art of whatever the third game was called, but as I am led to understand, this was easier to do as well as cheaper. Nevertheless, the character voices returning is gleefully welcomed. Ah how I longed to hear the nonchalant "Oops" of Guybrush screwing something up again. I checked the Telltale page and the team who made the game and Ron Gilbert's name cannot be seen anywhere. Then I checked Ron's personal page and saw no reference on Tales of Monkey Island or his inclusion in any parts of its development whatsoever. Hence, I concluded that he had nothing to do with it. I realize you are a fan of the extended MI series and consider any negative comments about it as something dirty and unholy, but if you want to "get someone's facts straight" then at least be so kind and back it up with actual arguments/references instead of just angry words. Ron is involved with the series in some capacity, though it hasn't been revealed how much. He is listed in the credits of the first episode, despite what it says on the website. I would assume the page you're referring to is a list of the core Telltale staff. Anyway, there is a reason for the lack of point-and-click navigation. The designers wanted a particular style for the game, and part of that means camera angles where you can't see the floor. Thus no pointy-clicky. Well, I checked Tales of Monkey Island team and full team and no mention of Ron Gilbert. The second secret is that TellTale is doing an episodic version of Monkey Island. I had the great pleasure of spending a few days with Dave Grossman, Mike Stemmle and the rest of the TellTale crew getting my head into Guybrush Threepwood again. [...] It's strange and humbling to see something you created 20 years ago take on a life of it's own. For me this means - no, he doesn't have anything to do with it. Anything major, at least. Don't get me wrong, I strongly support the Telltale games and their efforts to revitalize the point-and-click adventure genre. However, Monkey Island holds a special place for me and I REALLY think that everything from MI3 onwards went completely off Ron's vision. Behind all the quirky humour and everything, MI1 and MI2 had a strong sense of surreal, a facade, that you aren't REALLY playing a pirate adventure but rather that there is a second story underneath it all. I was one of the very few people that thouroughly enjoyed the bizarre ending of MI2 and was eager to see what - if anything - can happen after that mind****. MI3 and MI4 were very disappointing to me - not only because Ron wasn't in on it anymore, but also because they completely threw out the surreal angle and settled on play-it-safe "wacky Guybrush adventures" plotlines. And while I do enjoy this opportunity of being able to solve more puzzles in a nice Carribbean setting, it's just not the *true* Monkey Island series anymore. It's just fan fiction. GOOD fan fiction, mind you, thoroughly enjoyable fan fiction, but a fan fiction which completely obliterated the chance for us to eventually learn the REAL secret of Monkey Island, however strange or bizarre it might have been. Finally. Something that might kickstart the point and click adventure genre up again. It seems to have died, or at least it seems that no one is making them anymore. Of course there will always be a solid fan base for the genre, a fan base that started out with games like MI and Beneath a Steel Sky and of course Loom. Hopefully the attempt of a revival of the MI series will get enough newcomers to the genre hooked so that software teams start to make more of these type of games. I mean who wants a super blaster 9k with pulse fusion ammo in a game when you can have a good ol' rubber chicken with a pulley in the middle? Real time interactive combat system? Give me insult sword fighting any day. Sam Fisher, Gabe Logan, Snake, they used magazines, whistling, mouse traps, stun guns and all sorts of unnecessary gadgetry to infiltrate places when all they needed was the line "look behind you, A three headed monkey" (works every time except ironically when a three headed monkey actually shows up). The MI series is without doubt the second best I have ever seen (by that I mean the best..... you get it right ^^) and if I had a gun to my head and was asked to give an opinion I would have to say this could be one of the best things to happen to gaming as we know it for a long time, I'd say that without the gun too and if anyone disagrees with me then you sir fight like a dairy farmer. "Were any of the other original writers/artists involved with your game? Quite a few. Mike Stemmle and I were writer/designers on three of the LucasArts titles between us. Art leads Dave Bogan, Derek Sakai, and Kim Lyons also worked on Curse and Escape. We have a new soundtrack by the original composer, Michael Land. And we even managed to convince Ron Gilbert, the original father of Monkey Island, to come down and toss ideas around with us for a few days. OK, actually it wasn't very hard to convince him (but he's also working on his own game up at Hothead, so we couldn't keep him forever)." Tried the demo. Liked it quite a bit. Bought the game. I mean, sure the dark overtones are gone, the Burtonesque feel is nowhere to be found and it seems that the series is now permanently cemented in wacky Sunday-morning-cartoon land. But for what it's worth the writing seems to be quite good (and a huge improvement from the atrocity that was "Escape from Monkey Island"), the puzzles seem rather nice and overall it's hard not to get warmed up to this new series. Telltale seems to respect the original material a bit more then previous entries that more or less settled in copy-pasting the original characters and hoped that the players will be deliriously happy to see the familiar faces and ignore the complete disregard for continuity (I still can't get over how they butchered the original story in MI4). Bottom line, Monkey Island series seems to be in good hands. And if the Telltale team manages to involve Ron even more in future episodes development, perhaps there is hope that the storyline will at least partly get on track on where it should have been. Good to see you calmed down and actually played the game baba... See, doesn't that make things all better? Well, some of us unwind by commenting here, some by singing crappy songs. It's the way life goes, I guess. Aw... was that supposed to make me feel bad? Sounds like someone needs a nap. Guess the game didn't calm you down all that much... Maybe Episode 2 will help you out... Good Luck! Oh man. My husband introduced me to the Monkey Island series when we were dating, I'vel oved it ever since. His brother had us over the other night and introduced us to Screaming Narwhal, as he managed to get ahold of it before we did. SO much love. I really can't agree that the adventure series is in good hands. In fact, it hasn't been for a while. Once the pixels disappeared, and the voice acting was added, all of the promise and beauty of Monkey Island was perverted and ruined. The humor grew less witty, the characters grew lame, my heart was broken. The original game IS my childhood.